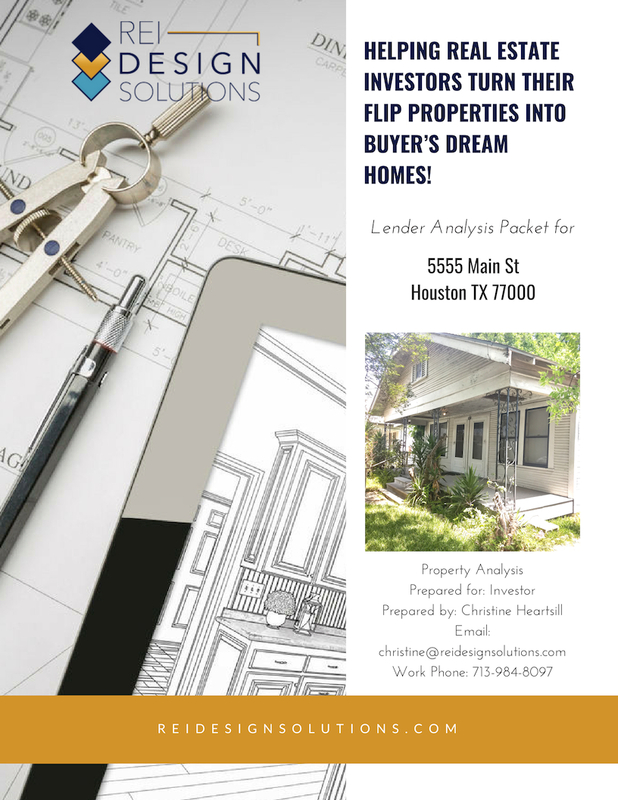 If you are an investor working on fix and flip projects and need help getting all of the necessary information to your lender so they will fund your deal, then we have a something for you! Once you get a property under contract, determining what to do with it can be a difficult task. Part of the process to close on your property and beginning your rehab is to provide your lender with an evaluation of your numbers so they can do, their due diligence to lend on it. 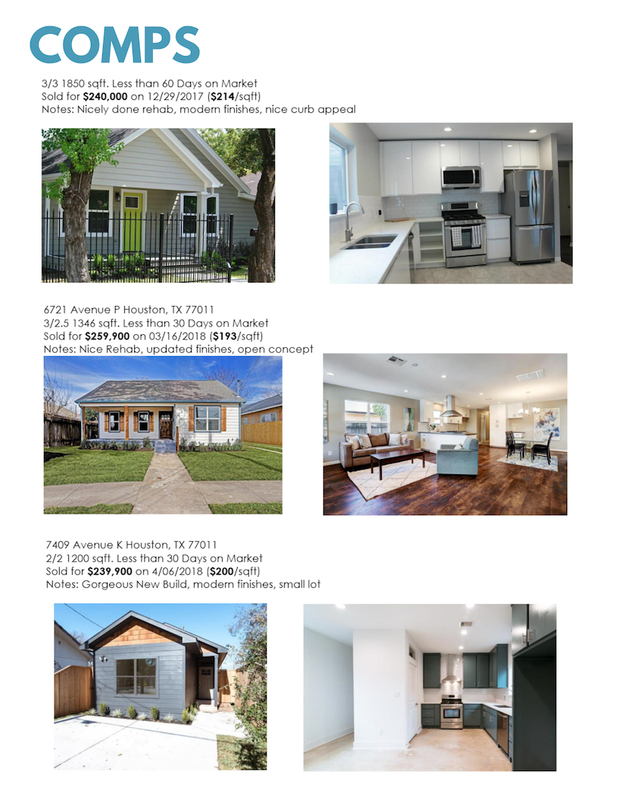 At REI Design Solutions, we have made it our goal to help investors complete profitable flips and new builds. One of the ways we do that, is by pulling all the necessary information together that your lender needs to appraise the property and fund the deal! We will consult with you on your project and provide you with a report, shown below, containing all of the important information your lender needs for their appraiser to determine the ARV for your property, so you can get approved and close! We will attend a 1-Hour on-site consultation to walk through the property and help you determine the best course of action. Fix and Flip investors, sometimes have really grand ideas of what they are going to do with a property to get it rehabbed and back on the market. Sometimes you need a second expert opinion to make sure you will get the ROI on those ideas. We can be your second set of eyes! The designers at REI Design Solutions are trained to know what design and construction elements will sell properties and what will be a waste of your rehab dollar. We make sure your rehab will pay you back in the end! One of the best ways to communicate to your lender what work will be performed is with a written scope of work. This condensed version of the Full Scope of Work we provide our design clients, included in this report, will provide your lender an overview of the interior finishes and necessary work to be performed. The proposed scope will increase the ARV to the top of the comps. When performing the initial walk-through, we may find that the property will need walls removed, rearranged bathrooms, or added space etc to make it appeal to the modern buyer. This basic “quick” floor plan will show your lender the proposed interior changes that will add value to your property. One of the most important factors in determining the ARV of your property is the area comps. We take an extensive look at the comparables for your property’s neighborhood and list at least 3 of them in the report so everyone involved (you, your lender etc) can make a wise decision surrounding your property. Finally, REI Design Solutions works closely with leading contractors in the Houston area to get you the best pricing on the work needed to increase the value of your property. This will be an ESTIMATE only for the purpose of determining your numbers, not a proposal for work. You will need to have your contractor provide you with final cost estimates. Order My fULL Report today!